As the 4-week countdown to D’Banj’s biggest UK headline tour begins, the KOKO Master has lined up a handful of exciting surprises and special announcements for his UK fans and audiences. The latest of which is that D’Banj and UBER have come together to offer his fans a free ride to the D’Banj concert, whether you’re in London, Birmingham or Manchester. Exclusive to fans and concert goers that are new to UBER, all you have to do to claim your free ride worth £15, is to enter the D’banj tour unique promo code – Emergency Concert, and you will be one step closer to experiencing, not just the biggest Afrobeats concert of the year, but also D’Banj’s biggest ever UK live experience, all thanks to UBER and the KOKO Master himself! This exciting partnership between D’Banj and UBER comes on the back of recent announcements that Davido protégés Mayorkun and Dremo will be joining D’Banj on all three dates of his UK tour, as well as UK guest artists Paigey Cakey and Ms Banks. And with more special guests and surprises to be announced shortly, D’Banj is already living up to his promise of delivering one of the best live concerts the UK has ever seen! As previously announced, D’Banj’s forthcoming UK tour will see multiple MTV European Music Award, BET Award, World Music Award, and MOBO Award winner headlining at the Manchester Academy on November 11, Birmingham’s Tower Ballroom on November 12, and the Indigo at The 02 in London on November 13, after a four year hiatus from the UK. This is NOT to be missed! 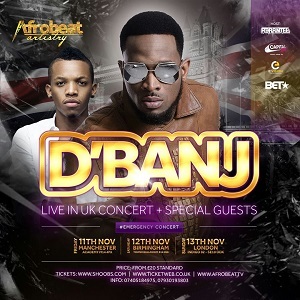 The 2016 D’Banj UK tour is powered by Afrobeat Artistry, and will be hosted by Capital Xtra’s veteran broadcasterAbrantee, with support from Afrobeats man of the moment Tekno, who will be performing a slew of his recent hits including ‘Duro’ and ‘Pana’, as well as rising stars Mayorkun and Dremo, and the UK's Paigey Cakey and Ms Banks, among a host of guest stars to be announced.